WriteToLearn is a flexible web-based writing and reading comprehension tool that allows students to put into practice what they learn from classroom instruction. The core of WriteToLearn is the automated scoring technology that provides immediate and personalized feedback and eliminates the need to manually grade papers. 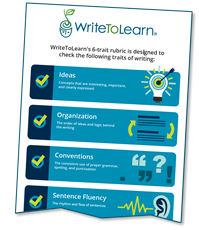 View an infographic that shows the six traits of writing WriteToLearn is designed to check.